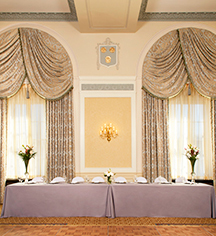 Fall into the tradition of elegance and grandeur of the most elegant historic ballrooms in Charleston and let features like antique chandeliers, 20-foot-high ceilings, monumental windows and marble-accented fireplaces create an ideal backdrop for your wedding. 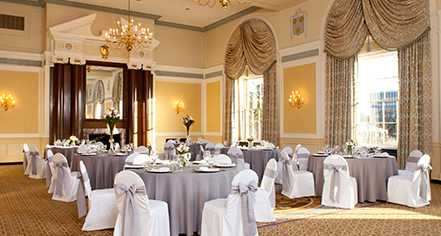 In addition to the stunning ballrooms, the Francis Marion Hotel has modern conveniences located right on the premises. For rejuvenation and relaxation, pamper yourself at Spa Adagio, one of the best spas in Charleston. The Swamp Fox Restaurant features low-country favorites and daily specials for breakfast, lunch and dinner, as well as private dining options for your rehearsal dinner or bridal luncheon. The restaurant also offers full catering service for your post-ceremony meal. From start to finish, the hotel’s professional wedding coordinators pay close attention to every detail so you don’t have to.